The Shape of the 2018 Elections: New Volunteers, New Movements? Results of the primary elections held during April through June begin to paint a picture of an evolving politics in the country. The results of the May and June primaries show that grassroots campaigns with women activists can be successful, although heavy financial support of the national parties’ leadership often gives victory to their endorsed candidates regardless of gender. For instance, in May, the Georgia Democratic primary for governor showed charismatic, heavily endorsed Stacey Abrams crushing Stacey Evans, whose campaign strategy seemed geared toward winning back poor rural voters. Incumbent and heavily backed Dianne Feinstein easily won the Democratic nomination for California’s Senate seat; a Democratic takeover of the Senate would make her chair of the powerful judiciary committee. Pundits are now predicting that women in Congress will reach at least 25% representation from their current level of 20%. While grassroots efforts are not always successful, they are effectively harnessing the renewed political awareness spreading – in both parties. In Kentucky, schoolteachers came out to support one of their own, Travis Benda, to defeat the GOP state House leader, Jonathan Shell. In the Democratic primary for Kentucky’s 6th Congressional district, former fighter pilot Amy McGrath won over DCCC endorsed Jim Gray. Vox.com found that in Texas, more than half of the 50 women running for Congress in both parties won their primaries. In California, Katie Hill, a grassroots progressive, won the Democratic primary for the 25th District Congressional seat. While the “Blue Wave” of winning Democrats likely to turn districts from Red to Blue is continuing through the summer, nonetheless, pundits are commenting that the Republican party is now really the party of Donald Trump, whose tweets are effective in supporting his followers, and that many Republicans in Congress are reluctant to counter him for fear of losing in the November election. While some extreme candidates – such as former coal executive and ex-con Don Blankenship of West Virginia – have been defeated in Republican primaries by more moderate candidates, others are still winning important elections. In June, for instance, longtime incumbent Mark Sanford lost South Carolina’s 1st Congressional District’s Republican primary, to Katy Arrington, a vocal Trump supporter, and white-supremacist-backed Corey Stewart gained the Republican nomination for the Virginia Senate contest. So although Democrats will clearly make gains in 2018, it is still problematic whether they can take back either house of Congress and probably will remain unpredictable until November. The final primaries will be held in August, after which we will know most party slates for the midterm election in November. It is important to remember that a lot can happen in the five months between now and then. 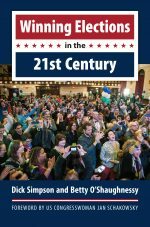 As we write in our book, Winning Elections in the 21st Century (Kansas University Press, 2016), the theme of the campaign is critical. In 2016, Donald Trump’s “Make America Great Again” and Bernie Sanders theme of fixing income inequality both resonated with the country. In 2018, both the women’s movement and disgust with Washington are working for candidates, and is reflected in both the campaign themes and the number of volunteers in especially many grassroots campaigns. This year, 422 women are at this date running for US House seats, and 49 women are running for the Senate. And they are often winning, especially in close races. In the May 15th Democratic primaries, women won one US Congressional district in Nebraska, two in Pennsylvania as well as two contested state house races, and won one of two highly contested state senate races in Oregon. Many of the women ran in Democratic primaries but more Republican women are running and winning as well. Most women candidates have the help of grassroots local groups, using the strategies described in Winning Elections. These (mostly) women are active mainly in local groups that are similar but not closely connected across the country. This is not just a case of a reverse Tea Party on the left taking over. As Lara Putnam and Theda Skocpol relate in a recent article, Progressive candidates have clearly won some elections but much of the change – especially the movement from Red to Blue is taking place in the suburban areas and being led by people who are pragmatic about winning. The new activists are not primarily leftist ideologues but retired teachers, librarians, and community leaders who don’t like the way the 2016 elections turned out or the Trump policies since then. Moreover, issues that have sat dormant, such as gerrymandering, ERA, and doing away with the Electoral College, are mobilizing activists. Some activists are addressing the fairness of wealthy candidates — such as the gubernatorial nominees for both parties in Illinois — self-financing their primary campaigns. But these volunteers — whether supporting candidates, issues, or both — as part of the “Me too” movement, the resistance, or just unhappy with the state of the country, are using their skills to do the old fashion precinct work, phone calling, and neighbor-to-neighbor contact that we recommend as essential for winning elections in the 21st century. The editor of the Emporia (Kansas) Gazette and the ‘Sage of Emporia,’ William Allen White is known for his quips, quotations, and a sharply crafted view from Main Street expressed in his 1896 essay, “What’s the Matter with Kansas?” But for all his carefully cultivated small-town sagacity, White (1868–1944) was a public figure and political operator on a grand scale. Writing the first biography in a half-century to look at this side of White’s character and career, Charles Delgadillo brings to life a leading light of a once-widespread liberal Republican movement that has largely become extinct. 1. When did you first have the idea to work on Crusader for Democracy? I discovered William Allen White while working on my dissertation. White was one of a group of four liberal reformers I was studying who were coming to terms with America’s rise as a great power between the World Wars. I admired White’s vision of America as the leading champion of democracy at home and abroad, and his willingness to act on his views by writing editorials, by privately lobbying policymakers, and by helping to lead the fight for public opinion. It wasn’t just White’s views that hooked me, though. I was impressed by White’s essential humanity. He was a man who never forgot what it’s like to be a human being: the hopes and disappointments, the victories and the defeats, the times when our path is clear and those when we lose our way. White’s name came up time and time again as I did my research, and the archivists at the Library of Congress told me that his collection is one of their most heavily used. I thought it was a tragedy that no one had written a biography of such a remarkable and important man in almost half a century, and it was a pleasure to take the job myself! Writing the book was fun! I was able to use about a third of my dissertation to jump-start the writing process, and it helped a lot that I already knew how to make the best use of the William Allen White papers at the Library of Congress. I started writing this book a few months after finishing my PhD in December 2010 and I worked on it fairly regularly through the summer of 2017. My work process was to accumulate as much raw material as possible during my three or four research trips each year. I spent most of the time reading and taking notes on the documents I had gathered, which I would then use to write up the narrative. 3. What was the most challenging aspect of writing about William Allen White? One of the most challenging aspects about writing about White is that he knew so many people and was involved in so many things. There were many great little stories that had to be left out of the book simply because I couldn’t talk about everything, and there were many times where I had to devote considerable attention to sorting out White’s intricate web of relationships. 4. In Crusader for Democracy, you write “Throughout his life, White felt the greatest threat to American democracy came from uneducated, backward, shortsighted masses who were easily duped by smooth-talking demagogues.” How do you think he would respond to the election of President Trump? I have no doubt that White would be appalled by the election of President Trump. White was a dyed-in-the-wool liberal, so he certainly would have opposed Trump on ideological grounds. However, White always displayed the unusual ability to remain personally friends with people who he ideologically opposed. For example, White established close friendships with conservative presidents such as Warren G. Harding and Calvin Coolidge. Ideology alone would not have caused White to reject Trump. The fact is that White believed in institutions of various kinds. He believed in what he called “neighborliness,” by which he meant that all Americans ought to treat each other with the same care and consideration they would give their small-town next-door neighbor. White believed in civility even in politics. Once, he asked his newspaper editor friends to be gracious towards a duplicitous opponent he had defeated in a bare-knuckles political campaign. Most important of all is the fact that White religiously adhered to a lifelong code of political and personal honor that prized honesty, sincerity, sacrifice, civic-mindedness, integrity, intellectual curiosity, and visionary leadership. Even if White had loved Trump’s policies (and he would have hated them), White would have rejected Trump simply because he would not have been able to stomach Trump’s many moral, intellectual, and personal shortcomings. I cannot imagine that White would or even could have remained a Republican in the age of Trump. The GOP is now Trump’s party, and at the moment there is no room in it for liberal Republicans like White. White would probably not have joined the Democrats, however. Most likely he would be an independent today, like millions of like-minded moderates who have been forced out of the GOP. I have no doubt that he would have used his gift for mass communication to help lead Americans away from Trumpism and towards the liberal Republicanism he advocated. 5. You illustrate how William Allen White was an outspoken progressive Republican. Can you speak to the similarities or differences between today’s GOP and the Republican party to which White belonged? The Republican Party White knew was demographically comprised of middle-class Midwesterners, the Eastern business elite, and aspirational middle-class businessmen. The party was more ideologically diverse as well, consisting of strong liberal and conservative factions that each enjoyed periods of dominance. It’s also important to note that the Republican Party of White’s day was more centralized and institutional, which meant that a man like White who had worked in the party for a half-century could use his personal connections to exercise considerable sway. Today’s Republican Party is very different. Demographically, the GOP rank and file is dominated by Southerners, the Rust Belt, and lower to middle class individuals who have suffered under globalization and fear America’s demographic trajectory. The wealthy business elite still controls much of party’s policy agenda, but there is always the danger that the populist fervor that drove the Trump campaign could be trained on them someday. The party’s ideology ranges from very conservative to hard-right, and liberal Republicans exist only in the history books. Today’s Republican Party is driven by charismatic personalities such as Trump, who are able to move the grassroots, and by the ultra-wealthy individuals who fund the GOP. 6. White is most well-known for his “What’s the Matter With Kansas?” Considering his ideological shift from the time he wrote that, do you think William Allen White would find something wrong with Kansas in 2018? Absolutely. White was very proud of the fact that Kansas was a leader in the Progressive movement. During White’s lifetime, the state enacted “direct democracy” reforms, it expanded its support for public higher education, it experimented with reforms designed to ensure that powerful corporations paid their fair share of taxes, it created a state Industrial Court that was arguably pro-worker at a time when other states were crushing workers, it enacted criminal justice reform designed to treat prisoners more humanely, it forced corporations to treat consumers more fairly, and it later embraced the New Deal. If White were to write “What’s the Matter With Kansas” today, he would have plenty of examples to sustain a fiery critique. To mention only one, White would be appalled at the way that the state government has defunded public education while gutting its own tax base. The state government is presently in the midst of a pitched battle between its judicial branch, which has ruled that the state’s education spending plan has unconstitutionally gutted education, and politicians who reject both the court’s findings and their constitutional duty to provide a quality education. Meanwhile, Kansas was ranked #5 on United Van Lines’ ranking of states that people are fleeing in January 2018. If White were to write his famous editorial today, he would not hesitate to connect the dots between the fight over education and migration patterns, just as he made the connection between populism and Kansas’ stagnation during the 1890s. I can think of a lot of people who need to read this book and who should, for the sake of the nation, learn to embrace William Allen White’s worldview, starting with Donald Trump. However, I can’t imagine that he or any other powerful political figure would actually change their ways for any reason, because they are all locked into the current political reality. 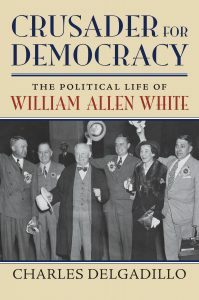 I would want this book to be read by millions of ordinary folks, who I hope would be inspired by White’s concept of democracy and the way he went about making good on his dreams. I would hope they would see that we can have a democracy where everyone has the right to play the game of life, where everyone who works hard and follows the rules is entitled to a decent living, where every person is treated with the same dignity and respect we expect for ourselves, and where government works for all Americans rather than just the rich and powerful.